The municipality of Haugesund (34,619 inhabitants; 73 sq. km) was founded in 1855, seceding from Torvastad. The town was once one of the Norwegian capitals of herring fishing. The flag of Haugesund is also used in its horizontal version. A photo shows it hoisted on the "Clipper Sund", operated by the local shipping company Brødrene Klovning. There is better image of this flag and banner. The ratio is approx 3:1. It is a white flag with the coat of arms shifted slightly to the top. The shield is topped by a golden (=yellow) mural crown with an open gate. The shield shows in a blue field three silver (=white) seagulls with golden (=yellow) beaks. They are ordered vertically. The lower seagull is a bit smaller. 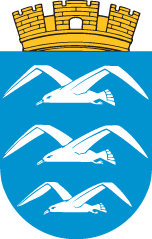 The arms of Haugesund, "Azure three seagulls argent per fess. The shield surmounted by a mural crown or", were adopted for the celebration of the 75th anniversary of the town. Designed by Hallvard Trætteberg, the arms were approved by Royal Decree on 3 May 1930, superseding the first arms of the town. The first arms of Haugesund, designed by A. Fenger Krog, were adopted on 29 December 1862 by the Municipal Council. The coat of arms depicts three open barrels, an anchor and three seagulls. The attributes recall that the town lived from herring fishing and shipping. The three barrels symbolize the mainland and the islands of Risøy and Hasseløy, forming three districts. The coat of arms (and presumably the flag) was approved by the royal resolution of 5 March 1930, drawn by Hallvard Trætteberg. The usual official blazon is not presented in [c2j87] (it seems hat until the mid-20th century the resolution did not include the official blazon), but it is described there as: "I blått tre flyvnde sølv måker" i.e. Azure three gulls volant argent. Further on [c2j87] state that the first arms were adopted by the city administration on 29 December 1862 after a drawing by A. Fenger Krog depicting a landscape with three opened barrels of herrings and an anchor in the foreground and in the background flying three natural gulls over the sea. The idea was that the herrings and the navigation were bases of the establishment of the city. The three barrels were also said to symbolise three parts of the city - the mainland, and the islands of Hasseløy and Risøy. On the occasions of 75th anniversary the new coat of arms was adopted when it was quoted (my translation): "that all was said without naming or forgetting even a single herring".